In September 2012, lighting struck a forested ridge above the Tierra Learning Center in Eastern Washington State in the United States. As operating officer Andrew Holm watched the plume of smoke rising from Sunitsch Canyon, one his first thoughts was, “thank goodness we did all that thinning work”. For the past two years, Andrew and his crew had been learning about forestry and searching for cost effective ways to reduce the thickets of small trees and brush crowding the Center’s forests—a legacy of 100 years of aggressive suppression of natural wildfires that is now coming back to threaten property and lives across the forested regions of the western United States. Land care is a priority for TLC, from the abundant organic gardens that supply meals to workers and visitors, to the forests of fir and pine surrounding the gardens and facilities. Seeking synergies in land management is key, and after learning about biochar, the crew felt it could be an important ingredient in making their forest fuel load reduction activities more ecologically and economically sustainable. Current practice for dealing with fuel load reduction in forests is to send in thinning crews who cut, pile, and burn the material to dispose of it, at a cost of about $2,000 an acre. With 220 forested acres to manage, TLC could not afford this waste-disposal approach to woody biomass, a material that ideally should be treated as a valuable resource. Working with the Chumstick Coalition, a local community forest health group, TLC started looking for beneficial uses for the excess biomass, and started two projects: certified sustainably harvested timber products and biochar production. TLC has done several commercial timber harvests on the land and attained Forest Stewardship Certification (FSC) for the timber products. However, there is still a great deal of lower value biomass to be disposed of. 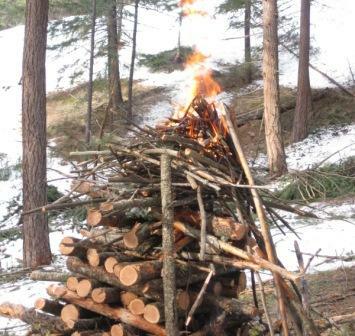 TLC hit on a way to salvage some value from burn piles by stacking four-foot lengths of the material in a grid pattern and using some of the fine branches and twigs to light a top-burning fire. 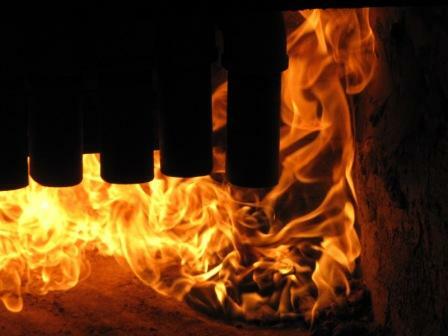 Top-burning fires are cleaner and hotter (they burn up part of the smoke) and can produce usable amounts of char if they are quenched before it all burns to ash. Read the story of this project on the TLC website. 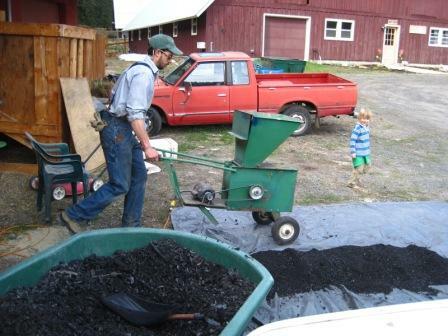 TLC farm manager Willie Stockman put some of the biochar into his worm bins with positive results and started side-dressing the fields with biochar-worm compost. But with 40 acres of vegetable gardens, orchards and hay and grain fields, the small amount of biochar from the burn piles did not go far. Looking for a more efficient way to produce biochar, TLC decided to work with New England Biochar and build an Adam Retort. 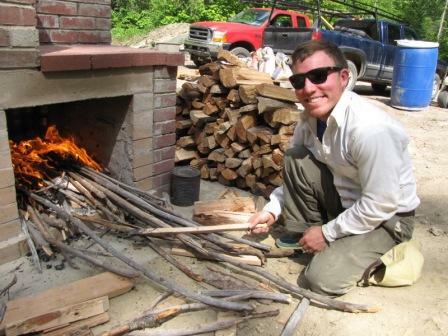 Peter Hirst of New England Biochar arrived onsite in May 2012, and directed the TLC crew in the week-long process of constructing the masonry retort. 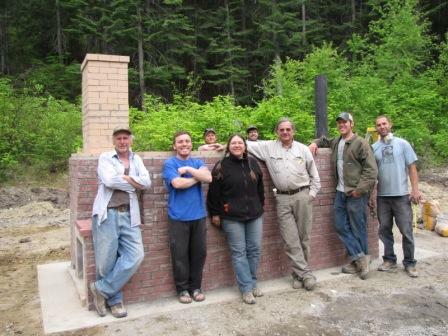 “It was amazing and fun” said Andrew Holm, “The construction manual is a bit mysterious, but Peter showed up with his magic tricks and somehow it all came together.” TLC had hired a master mason to oversee the complex masonry construction job, but for most of the crew, it was all another TLC “learning experience”. Since May, the retort has been operated 6 times, producing about 600 pounds of biochar in each batch. Each run has been somewhat different, Holm said, but the crew is learning more about the different phases of operation and how to optimize them. TLC is now busy building some additional infrastructure that will make operations more efficient. Most critical is a wood storage building that will keep the feedstock dry. They will also be getting an industrial grade leaf vacuum that can crush the char while containing the dust. The fire that ignited up Sunitch Canyon on September 2012 was contained within two days by a fire crew. It burned 13 acres, and it was the third wildfire on the land in 15 years. Tierra Learning Center has plenty of motivation to continue their quest for synergies in dealing with land management issues and biochar will continue to be an important component. For more information on Tierra Learning Center, please see: http://www.tierralearningcenter.org. A top-lit pile in the forest; all photos courtesy of Tierra Learning Center. Shredding the biochar post production.